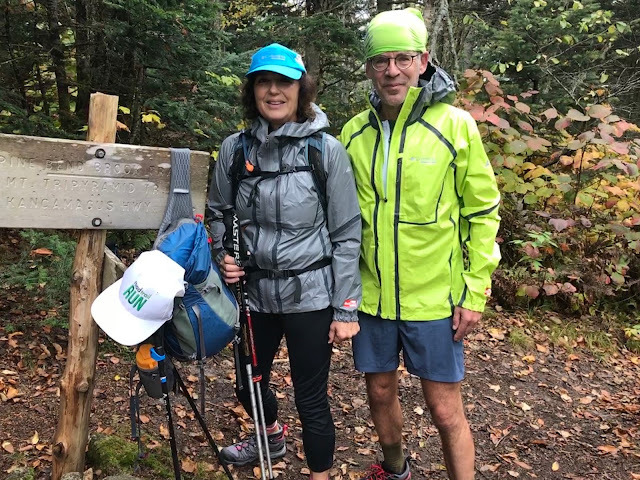 We tested the Columbia Montrail Caldorado Outdry Extreme, Inov-8 AT/C Stormshell and ProTec-Shell, Altra Wastach Jacket, and One Gore-Tex Active Run Jacket in a variety of conditions during road runs, trail runs, and hikes in New Hampshire and Colorado. Jeff is an accomplished Boulder, CO trail runner, Larisa is the recent winner of the Javelina Jundred. She trains on the road during the week and on the rugged trails of the White Mountains of New Hampshire on weekends. Sam and Dominique runs roads on the windy New Hampshire coast with excursions to the Whites. All four of us tested the Caldorado and Wasatch. Jeff, Larisa, and Sam tested the Inov-8 Stormshell. Jeff and Sam asp tested the Active Run. Sam tested the Pro-Shell. The Caldorado reverses the usual construction of waterproof breathable jackets by putting the membrane on the outside instead of below fabric on the outside with a very thin moisture dispersing layer on the inside. As such there is no fabric on the outside to wet through if the outside fabric’s DWR (durable water repellent coating) gets saturated. All the other jackets here except Caldorado and the Gore have outside fabric and DWR. The contrasting welded seam sealing is on the outside giving it a cool modern and striking contrasting look or blends in as in the women’s version. The jacket has a roomier longer fit than others here so great for layers but it has less stretch. A simple construction with high tech fabrics for sure, the Caldorado has one fairly large zip chest pocket into which the jacket can be packed, a fully adjustable hood with a bit of brim stiffener, and a draw cord hem. The cuffs are elastic. 3 covered “louvers” under the arms provide extra ventilation. Sam: The Caldorado is the most versatile of the jackets I tested when the expectation is for wind and wet. Light in weight, not overly clammy with sweat when combined with its generous fit, roomy enough for layers it particularly shined in wet conditions and strong cold wind. It had the least wet through of any of the jackets when saturated due to its membrane on the outside construction. I recommend wearing it with a long sleeve layer. The elastic sleeve cuffs while great in cold conditions lacked venting or the ability to open to air to vent and as such my forearms got a bit clammier than I would like in warmer conditions. Dominique: At a size medium the fit is snug in the chest for me yet it still allows good freedom of movement. It is an attractive jacket in its charcoal gray and flattering. It is key to layer correctly with this jacket. In the 30 F-40 F range don't over layer on the run. It can feel cold to the touch for more casual wear. Breathability is decent and waterproofing is outstanding. I really liked the snug fit of the hood but thought the brim visor could be a bit longer. Care tip.. because of its "slicker" surface, the Caldorado is easy to wipe clean! 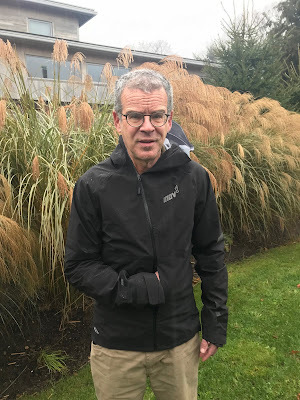 Jeff: This jacket is the most waterproof of the bunch, nothing is going to penetrate. On the flip side, it is also the least breathable and if going hard, especially in damp/wet/snowy conditions, you are going to get wet on the inside, so take your pick. The Caldorado however, even when wet, did a fine job containing body heat as I ran and blocked out all of the wind. The fabric is very crinkly and sounds a bit like a potato chip bag. Like the Inov 8 StormShell, the only pocket is a similar size chest pocket. Larisa: When it comes to pure protection against the elements, the Caldorado jacket shines. Robust and sturdy, it’s most at home in wet and/or extremely windy conditions. My women’s medium fits the most true to size of the three jackets I tested (the Inov-8 Stormshell running small and the Altra Wasatch running large). It’s also the least breathable, which can make it feel hot during faster efforts. As Jeff mentioned, the jacket makes a crinkling noise which I found quite loud when initially trying it on. However, when actually running I didn’t notice the noise at all. 20,000 HH waterproof rating, with a 20,000 B-1 breathability rating. The Stormshell is 2.5 layer Pertex Shield build. It is the next to lightest jacket in the round up with a longer and somewhat snugger chest and sleeve fit than the super light Gore-Tex Active Runner. It has a full hood with stiffer brim and drawcord and an elastic hem. It stuffs into its single chest pocket. It has handy thumb holes, The zipper is very small, maybe fragile long term and somewhat hard to engage. The prominent branding is reflective. Sam: While decently long the StormShell has the snuggest chest fit of any of the jackets for me. It has run jacket fit in a shell format. I found it most effective in cool temperatures under 40F and wind where its warmth from the snug fit shined. In warmer temperatures it tended to be clammier than some of the other looser fitting jackets. 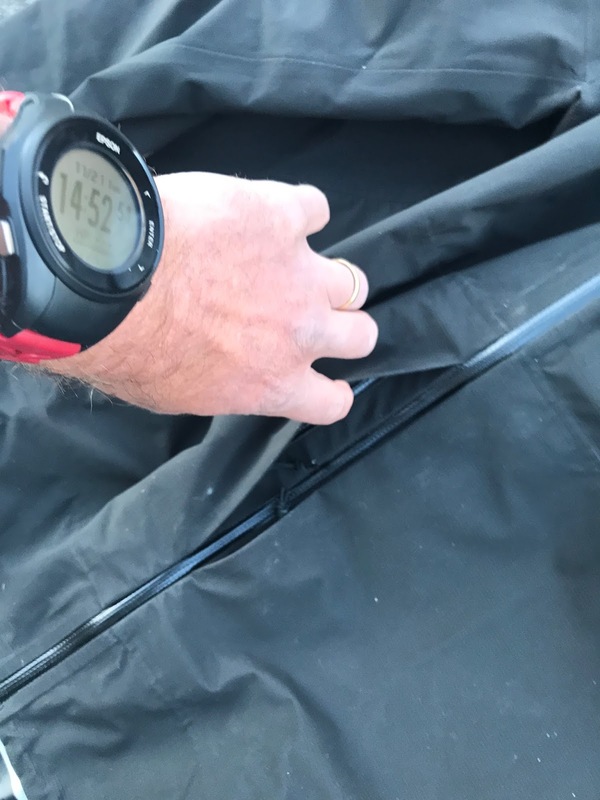 It does not have under arm ventilation holes or louvers as the Wasatch and Caldorado do and has fairly snug elastic cuffs which do not let much cooling air through. The Storm Shell, due to its light weight and packability, is an ideal top of the windy ridge line, at the summit protective jacket in moderate conditions where heavy layers are not need and for open road windy cold running conditions where a snug fit and a bit of warmth is in order. Jeff: The Stormshell fabric is similar to the Wasatch, but thinner, a little less water resistant and soaks out equally fast. Fit is on the slim/athletic side, which is great if just using with a single layer underneath, but if cold, layering could be a challenge. Unlike the Wasatch, the StormShell only has a singular chest pocket, large enough for a smartphone, or a few small items. Larisa: The Stormshell is an excellent jacket for long excursions in the mountains. It’s minimal yet dependable, making it a great option for days on which one wants to travel light and fast. I’m particularly impressed by its portability. 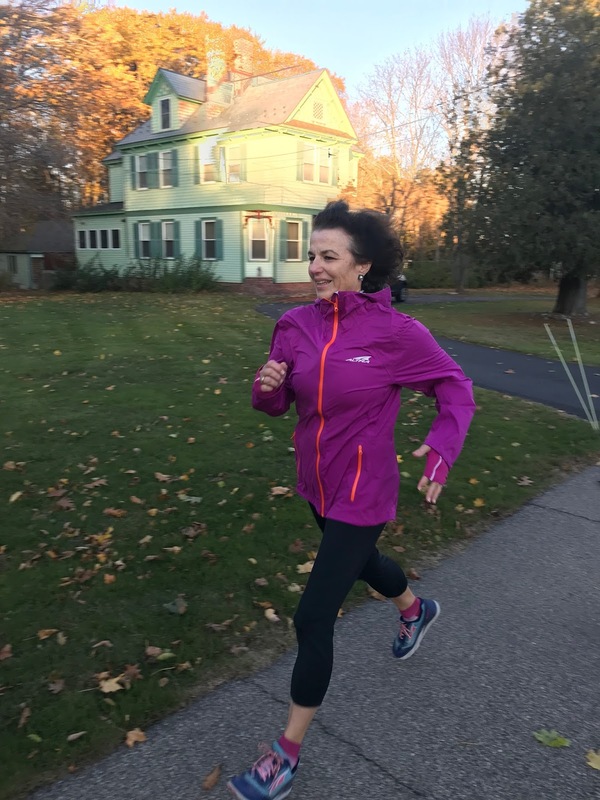 Of the three jackets I tested, the Stormshell packs down the smallest by a large margin, fitting easily into a race vest or backpack. The fit on my women’s medium was snug and short all around. The torso hits right at hip height, a couple inches shorter than I typically go for in a jacket. I was concerned this would result in the jacket riding up when running, but thankfully my fears were unfounded. It stays securely in place, even when wearing a race vest. The arms also run short, and were too short for me to use the thumbholes. That said, as a tall gal with long limbs I’m a tricky one to fit, so I’m sure the arm length will work perfectly for most! Snug as it is, I’m still able to fit two layers underneath – one tech shirt, and one medium-weight long sleeve. Adding the Stormshell to my kit provided a great setup for blustery days up high. It kept me warm and comfortable above treeline in ~25mph winds and 30 degree temperatures. 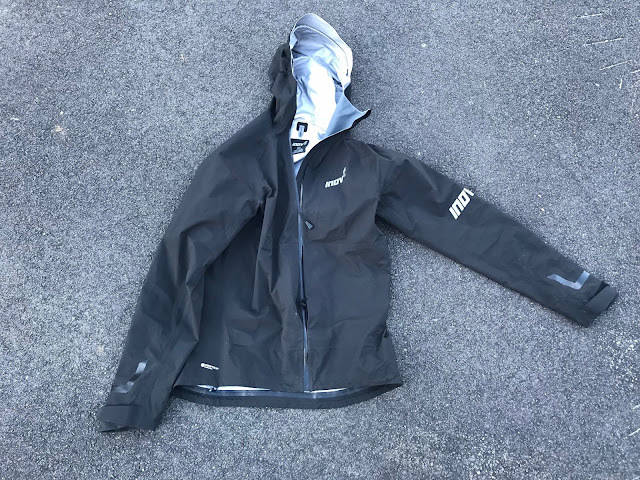 Inov-8 did not share a breathability rating of this jacket but did for their Storm Shell saying: "laboratory breathability tests favour non-air permeable hydrophilic film technologies and are not relevant for fabrics such as the air permeable technology use on the Protec Shell." As far as we know all the other jackets in this review use non air permeable hydrophilic film. 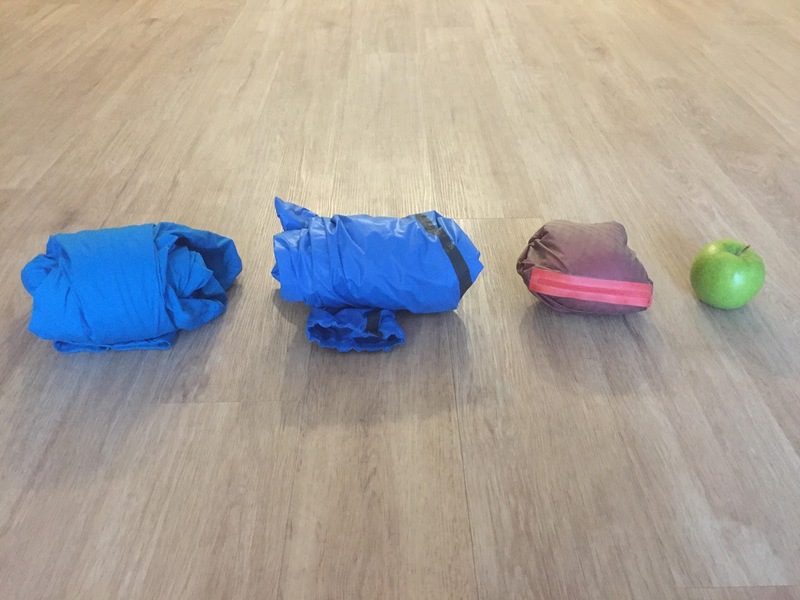 The Pro-Shell is considerably beefier in materials (and weight) than the others here. 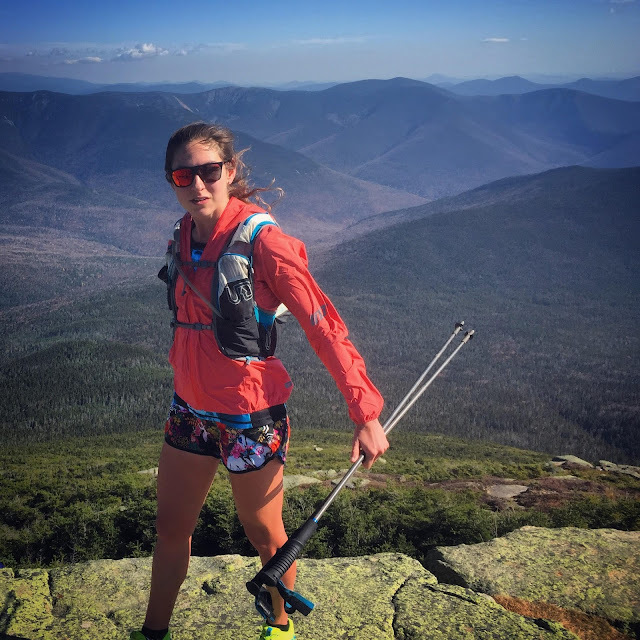 It is clearly a highly durable, full mountain shell designed for running, hiking, and skiing in the worse conditions for extended periods of time. It uses Pertex Shield Pro fabric which has a waterproof breathable membrane which is air permeable,unlike others here which are hydrophilic. It is air permeable through evenly spaced tiny pores in the membrane. Inov-8 claims that air permeable membranes allow body heat to vent directly to the outside while hydrophilic membranes absorb heat and then disperse to the outside surface and as such we understand are susceptible to wetting through and getting overloaded. Not to worry that air permeable means wind proofing suffers. The jacket was totally windproof in stiff coastal gales. 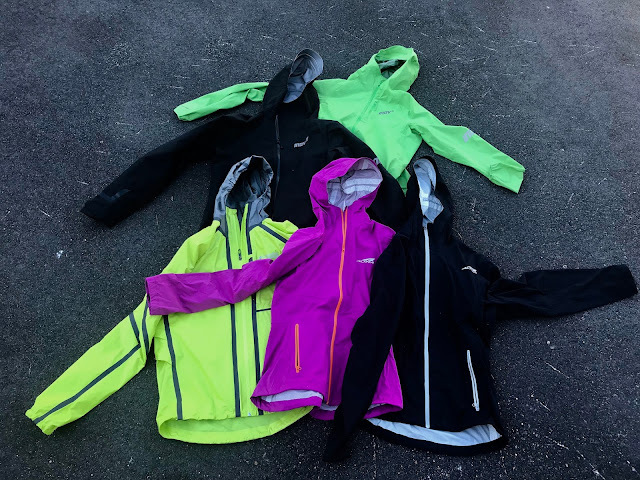 The Pro-Shell as a full on mountain shell has a full wire drawcord adjustable hood with stiff brim and soft chin face lining around the front top of its offset zipper and chin flap. To name that big hood when it is not needed it can be rolled up and hooked inside. There is a waist draw draw cord. It has water resistant front and side pocket zippers. The two low, waist level mesh Napoleon side pockets on either side of the zipper, with their zippers hidden under protective flaps, are very large and will hold hats, gloves, phones, and much more. The prominent branding is reflective. The fit is generous allowing for plenty of layers. The length is somewhat shorter than a full mountain shell so as to not get in the way of running or other leg moving pursuits. Sam: This is clearly the shell to take if your life may depend on having full mountain protection on the move. Most often such shells are saunas while running, or the more minimal lighter types such as the others here, just don’t provide enough lasting protection when things get wild and for long periods of time. 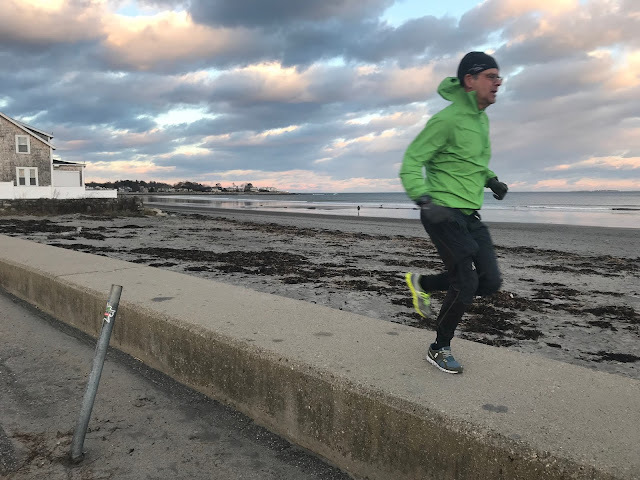 Even in moderate temperatures in the low 40’s with and without wind, temperature regulation was excellent, very close to on par with the other jackets and the air permeability in wind seemed to dry sweat very fast. This said this jacket shines in big wind and wet where the combination of breathability, wind protection, and waterproofing are essential. 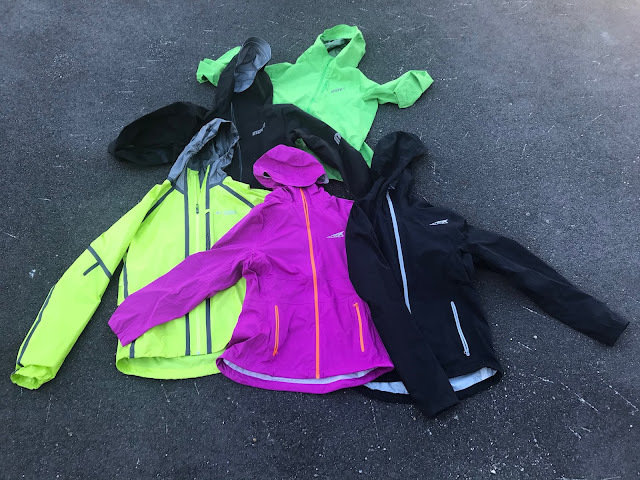 The Wasatch represents Altra’s first venture into running shells and they have delivered a very full featured, comfortable, high performance jacket here. It is the softest feeling and stretchiest of any of the jackets in this article. The ZeroH2O™ membrane is proprietary to Altra and by spec is comparable to the Storm Shell with potentially slightly better breathability, Full featured for its light weight, it includes roomy pockets down low for access to essentials while wearing a pack, a drawstring hood with a brim, drawstring waist, and laser cut ventilation holes under the arms. The sleeve openings are just right, with no elastic, relying on the jacket stretch and easy to pull up to see a watch, not the case with some of the others. The sleeves also include an elastic thumb loop, the “Thumblock”, to snug them over the hands, complimenting the more open cuff when conditions get tough. Nice touch! Sam: The Wastach is a jacket which can go anywhere, including for day to day wear and travel as it has classic, subtle styling and isn’t as “shiny” as some of the others. The comfort is outstanding and there is room for layers underneath. 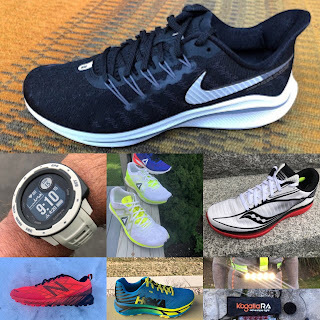 I plan on using it for winter nordic skiing and running in cold, dry conditions. 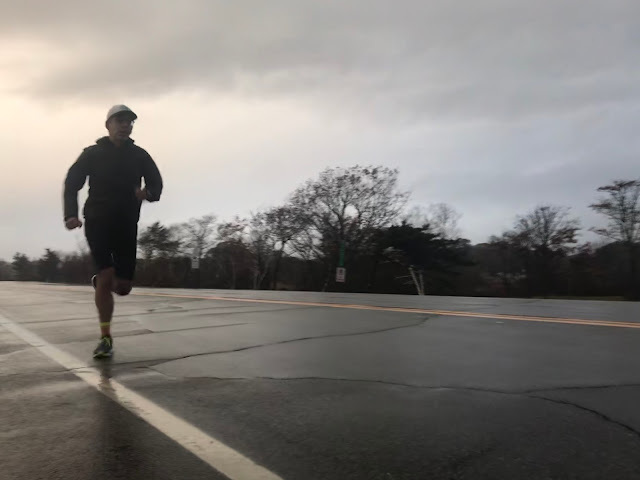 They are the only sleeves here that can be rolled up the forearm a ways something I like to do when running even in the cold. I found the inner lining to be the slickest with the least texture, so easy to pull over layers but also as a result clammier than the others when wet particularly in the sleeves when used in warmer temperatures, The soft outside fabric while super comfortable did have a tendency to wet through quicker than the others here. Jeff: The Wasatch has a generous fit and is perfect for layering underneath. Because of the added room inside, it allows for slightly better freedom of movement, along with better airflow than the other jackets reviewed here. Additionally, the Wasatch has micro holes under the armpits to allow for some added airflow and breathability, without sacrificing water resistance. Though I appreciate the minimalistic intent of all of the jackets here, I do however very much appreciate that the Wasatch has full size hand pockets for stashing gloves, beanies food or your hands if need be. Waterproofing is good, but this fabric soaks out quickly. Larisa: It’s clear Altra put a lot of thought into the Wasatch jacket. The shell is packed with lots of fantastic features and details, all of which enhance its function and make it a delight to run in. Temperatures have been dipping into the high 20s here in New Hampshire as of late, and I’ve found myself reaching for the Wasatch on most of my recent runs. My women’s medium has a very generous fit which might almost be too roomy for some. The torso runs long, hitting right below my glutes, yet can be cinched at the bottom with an elastic drawstring. The arms also run long (a much-welcome feature for this tall gal! ), and have elastic “thumblocks” vs. traditional thumbholes. The thumblocks are fantastic and make it possible to wear the jacket with gloves of varying thickness. The roomy fit makes the Wasatch an excellent layering jacket (I can fit a hooded sweatshirt underneath it), yet it works just as well on its own. Though the Inov-8 Stormshell is more packable, the Wasatch does fold down nicely and fits comfortably in a race vest. The Wastach is roomier than the Caldorado all around but is still a flattering jacket. It drapes better and is more comfortable to the touch. The sleeves are a little long and loose when not using the Tumblock elastics but when needed they snug the cuff and provide extra protection. The hood has a substantial brim and fits well. In moderate temperatures layering is important to prevent overheating. There is no need to over dress to stay warm. I am looking forward to using it in colder conditions for running and nordic skiing. Sports aside, it's great around town. The Active Run features Gore-Tex’s Shake Dry “fabric”. Fabric is in quotes as with the Outdry, and unlike the Inov-8 and Altra, the waterproof breathable membrane is the outside of the jacket with no fabric outer layer, The result is no outer fabric layer fabric saturation which means more breathability..
Sam: The Shake Dry comes from being able to literally shake beaded water off the surface, or at least until the membrane is saturated which I was able to do on a 5 mile run in heavy rain. From full soaked to hanging on a door knob at room temperature it took a touch over two hours to dry completely, The fabric feel is only slightly more substantial and crinkly feeling than a traditional wind breaker and is softer and lighter than the Outdry. It is very comfortable and incredibly light, the lightest jacket here at 112 grams for a men’s medium. The subtle bronze color branding is reflective. The Active has a single chest pocket to carry a phone and a bit more and to serve as as stuff sack for the jacket, The hood and waist has no drawstring and the hood no brim but do have elasticized hems. The hood fit is excellent, secure and form fitting even with the jacket not totally zipped all the way up. The cuffs are also elastic, and unlike the Caldorado they are not overly snug allowing cooling air and easier roll up to see a watch but you won't be able to roll these or any of the sleeves of the jackets here all the way up to your elbows, something I like to do. The Active Run Jacket is well named. 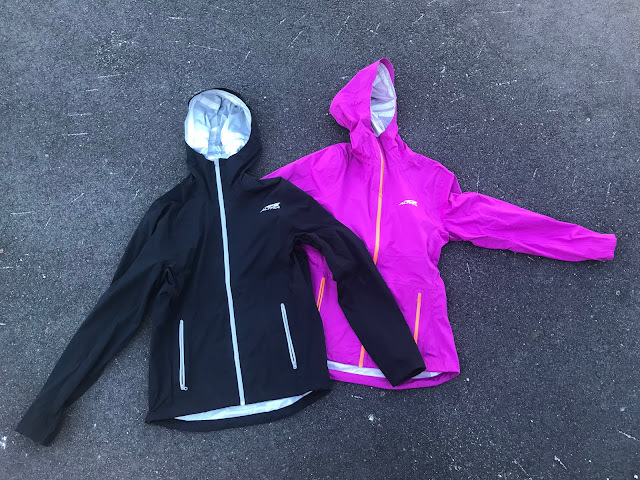 It is the shortest length of any of the others and is not designed to be a running mountain shell but should be seen as a high output running jacket with focus on breathability and some light rain protection. 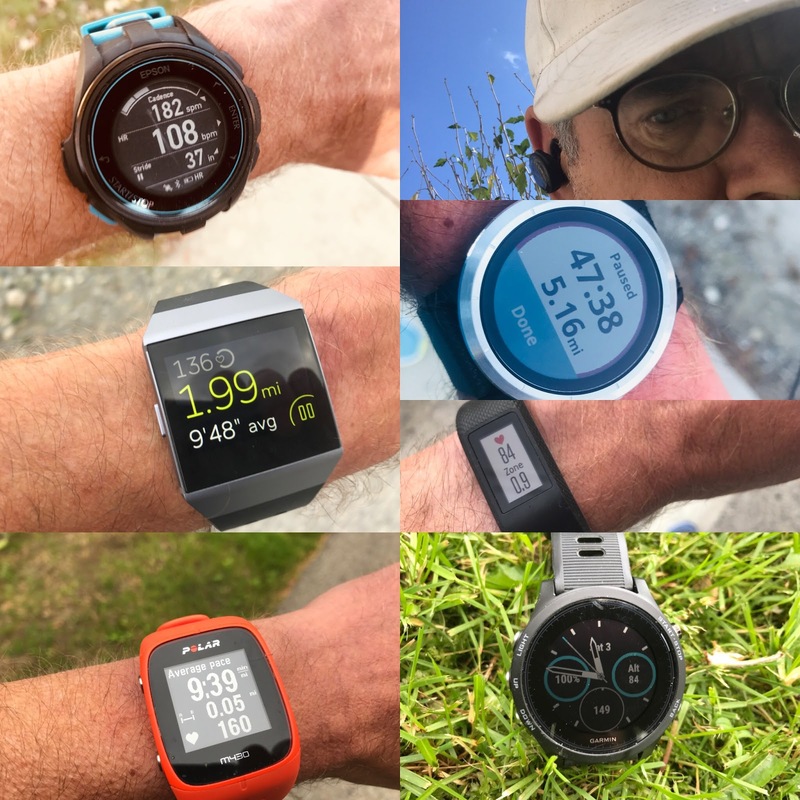 It is ideal stashed in a run vest or even clipped in its stash pocket to your shorts or even stuffed in a short pocket for days when weather is uncertain but not necessarily guaranteed bad. Jeff: The most minimal jacket of the bunch with a great balance of light weight, rain protection and breathability. 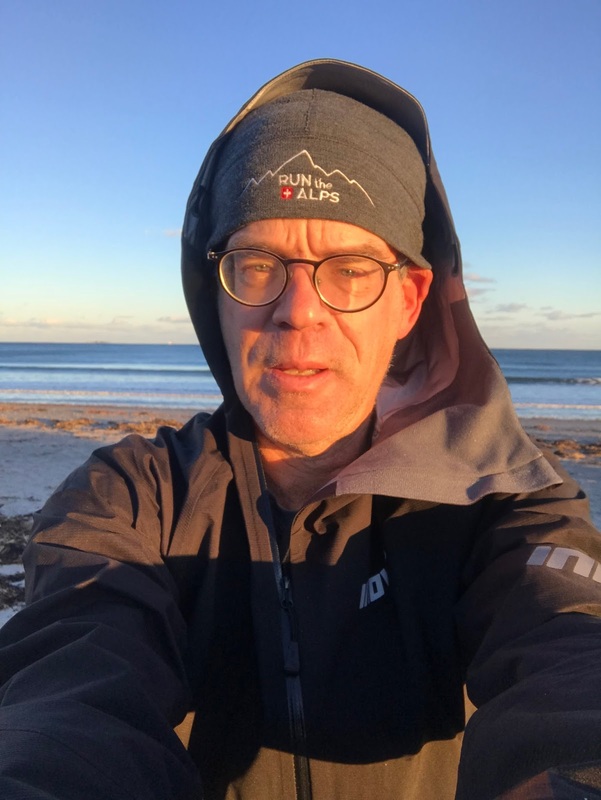 Like the Stormshell and Caldorado, just a chest pocket, but unlike all 3 of the above, does not have a hood cinch, which would be a problem in most jackets, but stays impressively secure even in very high winds. The hemline is higher than the others, saving weight, but reducing coverage and it tends to ride up, especially in high winds. A little bit longer below the waist and with a drawcord would be an improvement, but of course would add weight. All 4 jackets are very nice and I think that each has notable strengths/weaknesses that dictate the ideal use. 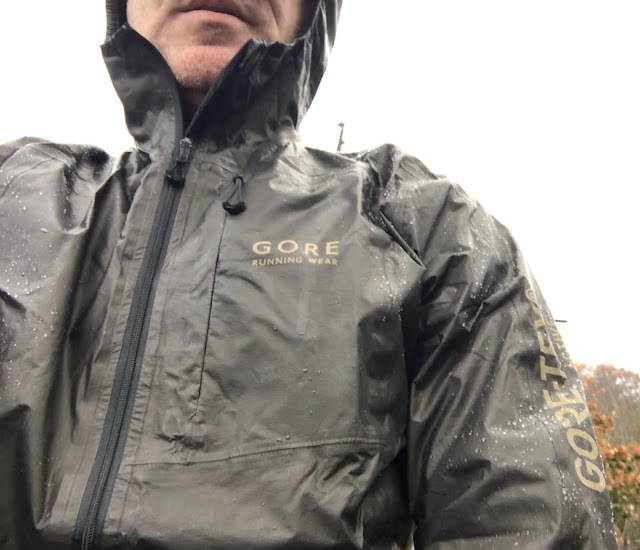 If you want a fine balance of most minimal weight, rain protection and breathability, the Gore Tex Active Run is a great option and will be my first pick when I am counting grams. It also compacts and compresses the smallest and can stuff into some very small run vest pockets. When cold and snowy (dry snow), I’ll for sure be selecting the Altra Wasatch for the ability to layer comfortably underneath and for the normal hand pockets, where I am almost always stashing some sort of cold weather gear there. 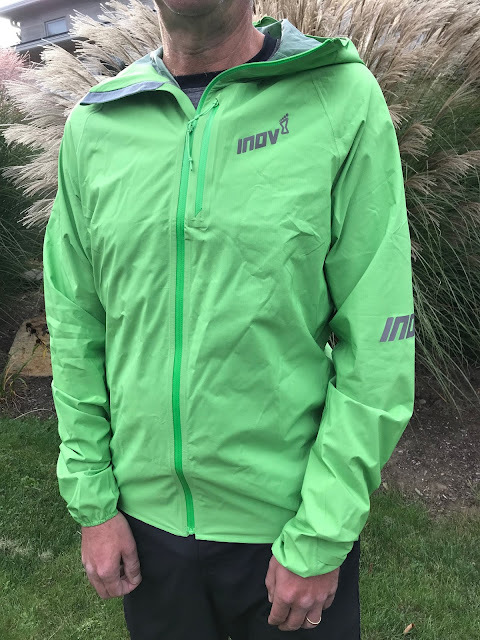 For shorter runs where it is wet, but warmer (layering less underneath) and looking sporty and fast is important, the Inov 8 Stormshell is a fine pick. For the worst weather days and when visiting high peaks, where wind and driving rain/snow is a possibility, the Columbia/Montrail Caldorado Outdry will without a doubt be a fixture in my running pack and also has a roomy enough fit to allow for layering underneath. For pure protection against the elements, the Caldorado jacket shines. Robust and sturdy, it’s most at home in wet and/or extremely windy conditions. Wasatch is packed with lots of fantastic features and details, all of which enhance its function and make it a delight to run in. The roomy fit makes the Wasatch an excellent layering jacket. The Stormshell is an excellent jacket for long excursions in the mountains. I’m particularly impressed by its portability. It's hard to decide between the Wastach and the Caldorado.. I will reach for the Caldorado for wet windy runs and New Hampshire hiking. The Wasatch will be my goto for dry cold run and nordic ski conditions and around town. For daily road runs in cool windy conditions where heavy precipitation is not expected and for that just in case jacket in a race vest or even shorts front pocket I would pick the Gore Active. For cold, dry winter run and nordic ski conditions, travel, and everyday use due to its classic style and pockets I would pick the Wastach. 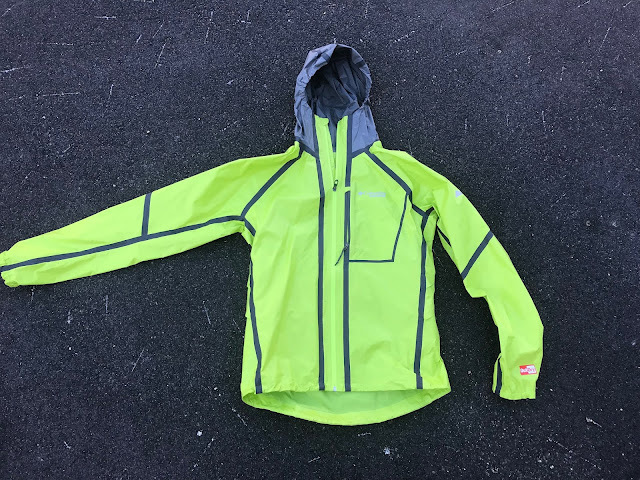 For cold winter runs in windy conditions and as a quick on and off at the summit or ridge jacket more temperate conditions where other layers are not required I would chose the Storm Shell for its portability, snug fit and longer length than the Gore Active. 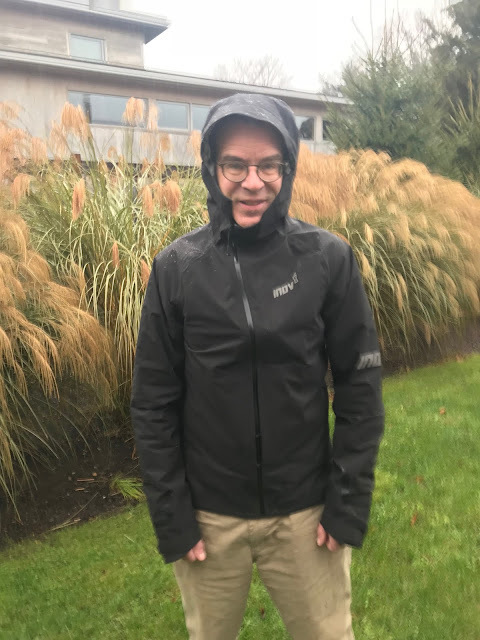 For the roughest conditions of wind, rain, and cold where bombproof protection is essentia,l while none the less being also breathable enough for moderate conditions, the Pro-Shell despite its high price would be my go to. For overall versatility with a focus on wet conditions and wind at a very light weight for all the protection, room for layers and decent breathability the “slicker”, and slick looking, Caldorado would be my choice. The jackets were provided at no cost.The opinions herein are entirely the authors'.